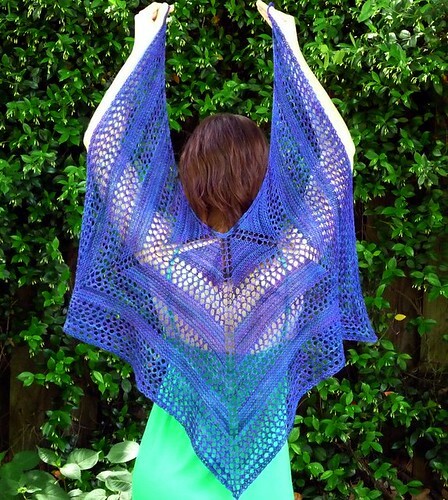 A triangular shawl worked in a lattice pattern from tip to shoulders, with optional fringe. An open and lacy stitch knit with a heavy worsted weight yarn on large needles creates a wonderful contrast. This deceptively simple stitch pattern is great for beginner to advanced knitters. Perfect for those cooler spring days and to chase the chill off your shoulders when the air conditioner is turned all the way down. Transitions to winter wonderfully, when it can be wrapped around your neck to keep the cold wind at bay. Available in three sizes: Small, Medium and Large. Or as I like to refer to them: Kerchief, Shawlette and Shawl. The Small is knit on size US 11/8mm needles, the Medium and Large are knit on size US 13/9mm needles. A reversible raglan shawl with alternating garter stitch and eyelet sections knit from the center of the neck down. Vixen is the perfect shape to sit on the shoulders without slipping and an interesting change of pace from triangular shawls. The pattern begins with a garter stitch tab using a crochet provisional cast on, but you may use any provisional cast on you prefer. Eight increases are made every right side row. Both written and charted instructions are provided in this pattern. Finished size: 48” across shoulders, 24” from neck to tip. Gauge is not crucial for this project, but if your gauge varies greatly from that which is recommended, your finished shawl will differ in size from the measurements given. Adjust needle size if necessary. 13 sts and 22 rows = 4” / 10cm in garter st, blocked. This pattern is available individually or as part of the Something Sweet eBook. An airy shrug knit in lightweight yarn, great for adding a little modesty to a slinky dress or giving some style to a T-shirt and jeans. Sweet details include eyelets threaded with ribbon and turned picot hems on the cuffs and neckband. This shrug is worked from cuff to cuff, starting in the round, switching to knitting flat and then back to in the round. Once the sleeves and body are complete, the neckband is picked up from the body and knit in the round. A provisional CO for the left sleeve hem helps eliminate a bulky seam when sewing down the cuff. On both cuffs the live stitches are sewn down instead of bound off. A knitted bind off is used to attach the neckband to the body. The sizing on this shrug is easy to suit to your own shape. By knowing your upper arm and shoulder to shoulder measurements, you’ll be able to get a great custom fit! Size chart (shown below) and instructions on how to customize your fit are included. 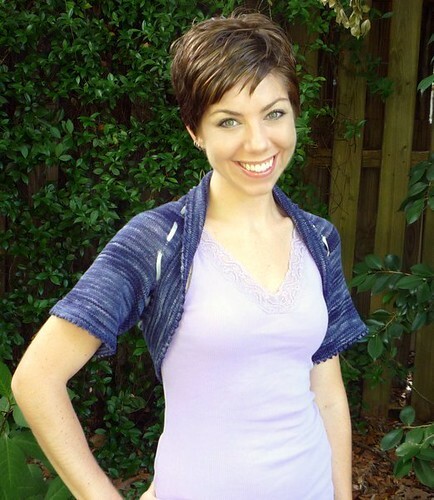 Blue sample is modeled in a size S with 2 inches positive ease for the sleeve circumference and zero ease on the shoulder to shoulder measurement. This garment is intended to be worn with approximately 1.5 to 2.5 inches of positive ease on the sleeve and zero ease on the shoulder to shoulder measurement. 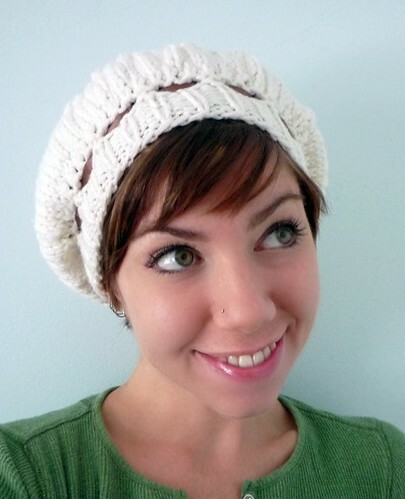 A slouchy hat that resembles a light and fluffy swirl of meringue. Eyelets laced through with ribbon add plenty of charm. This hat knits up quickly in a bulky yarn, so you can be topped off with this sugary confection in no time! 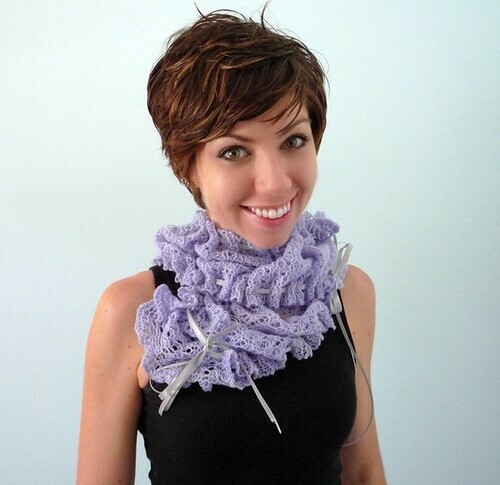 A light and airy scarf with a twisting stitch pattern and cute ruffles. Make it in lace weight or worsted weight or one of each. This pattern knits up quickly and is easy to memorize. 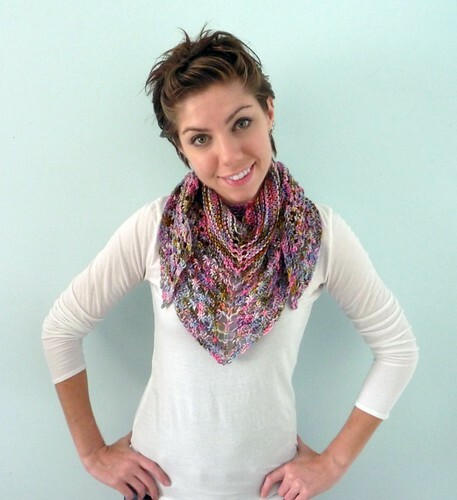 Optional lacing feature provides multiple ways to wear this sweet scarf! 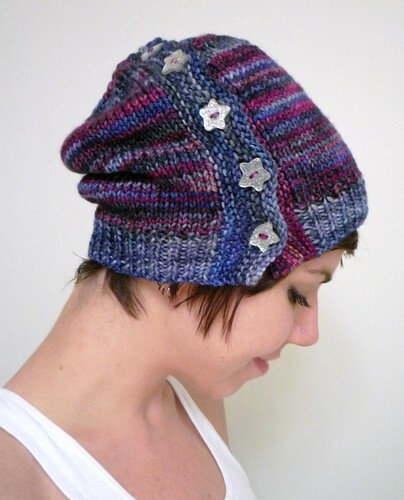 A link to a photo tutorial of the stitch pattern is included in the pattern. This pattern is available individually and as part of the Something Sweet eBook. This simple shawlette design is perfect for using those single skeins of candy colored variegated yarn that follow you home from the yarn shop, but can’t find a use for. The garter stitch and open star stitch sections help break up unwanted pooling and show off quick color changes. This pattern can be worked in any weight yarn by adjusting needle size and the number of pattern repeats. To make a larger or smaller shawlette, add or subtract repeats from either section, additional details are included in the pattern on where to add and subtract rows. one piece, worked from side to side. 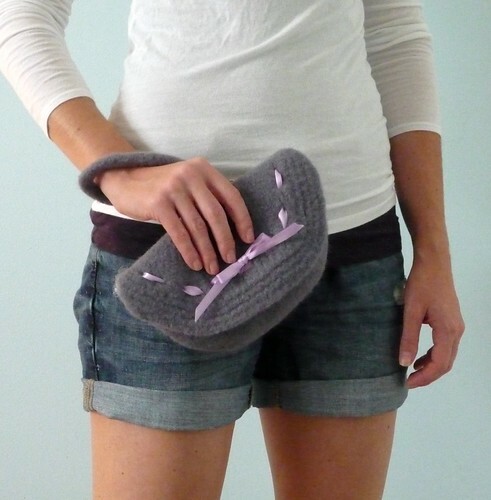 Cream Puff is a felted clutch with sweet details that knits up in no time. With a wrist strap and magnetic snap closure, it will quickly become your new favorite bag. So quick and easy to make, you can have one in every color! Share the love and make some for your friends, Cream Puff is an inexpensive gift that any girl would be happy to receive. A link to a photo tutorial of the finishing techniques used in this pattern, as well as other helpful links are included. patterns show off colorful yarn in different ways, try stockinette stripes or a fun texture. This hat is perfect for flaunting funky buttons. Wear it two ways: fold the brim up for a beanie style or leave it down for a little bit of slouch. Go ahead…have some Candy! Links to helpful tutorials are included in the pattern. 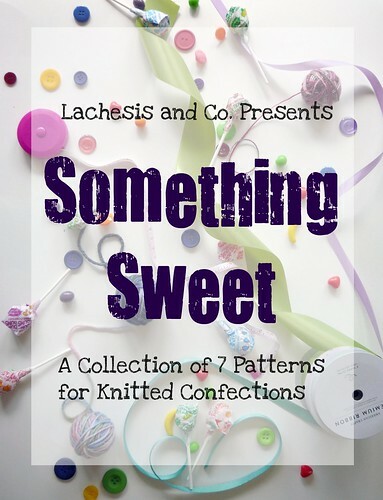 Something Sweet is a collection of 7 patterns for knitted confections. Projects include a range of accessories that will be the icing on the cake! A lovely, lacy capelet that is perfect for adding an extra layer of warmth and beauty to your winter attire. This piece is extremely versatile and can be worn over or under a winter coat, or worn inside as an easy to remove layer when it gets a little too warm by the fireplace. Two large buttons keep the capelet closed. The delicate, meandering lace in a bulky yarn is a wonderful contrast and makes for a beautiful and fast knit. This pattern is worked from side to side, or buttonband to buttonband, all in one piece. The only finishing needed is blocking, attaching the buttons and weaving in the ends! The collar is worked in garter stitch and tucked once per body lace repeat, to provide shaping for the neck and shoulders. Both charted and written instructions are included for the lace on the body and the edging. XS (S, M, L, XL) to fit a shoulder to shoulder (across upper back) measurement of up to 16/40 (19/48, 21/53, 23/59, 25/63) inches/cm (samples shown in S), if you are between sizes, choose the next size up. 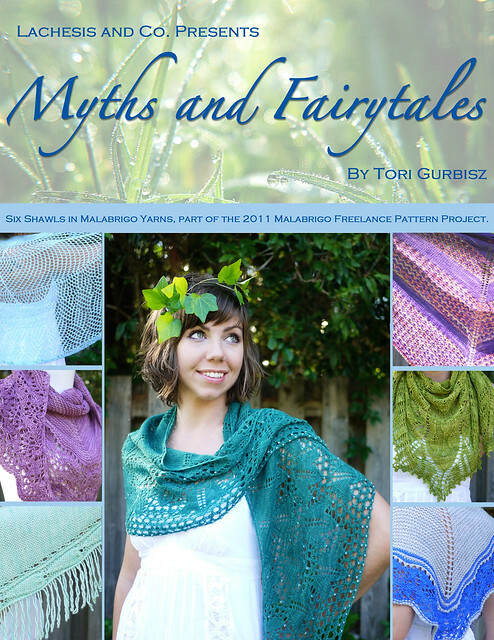 This pattern is available individually and as part of the Myths and Fairytales eBook. A lovely fringed shawlette accented with leaves and eyelets. home and for staying warm in King Haggard’s drafty castle. accessory to your wardrobe! This pattern was inspired by one of my favorite books as a child (and animated films), The Last Unicorn by Peter S. Beagle. This pattern is worked from side to side, with increases and decreases along the bottom edge of the shawlette body to form a shallow curved shape. A leaf pattern with dropped stitches creates a beautiful fringed edge. It is easy to customize the size of this shawlette by adding or subtracting repeats in any section. Just be sure to use the same number of repeats for the Increase and Decrease Sections. Malabrigo Silky Merino, 50% Silk, 50% Baby Merino wool; 150yards/50 grams, shown in Spring Water - 3 skeins (the sample took every last yard of 2 skeins, an extra is listed to ensure there will be enough yarn to complete the shawlette as shown). A beautiful and lacey shawlette worked at a loose gauge for a wonderful drape. Named for the Daphnaie, nymphs of the laurel tree, in Greek Mythology. Varying lace and leaf patterns echo the forest where the nymphs dance around their trees and the leaves they adorn themselves with. This shawlette is worked from the neck down beginning with a provisionally cast on garter stitch tab. Four increases are made every right side row. In the Edge Set Up section the center panel is decreased down to a single center stitch. To increase the size of the shawlette, additional repeats of the Main Body section may be worked and additional rows are given for the edge pattern. Both written and charted instructions are included. One size, 58 inch/147 cm wingspan, 24 inch/61 cm depth, with additional information for increasing or decreasing the size. Malabrigo Sock, 100% Merino wool 440 yards/100 grams, shown in Lettuce - 1 skein. In Hans Christian Andersen’s The Wild Swans, Elisa is a beautiful princess with eleven brothers. When her brothers are cursed and turned into swans, she takes a vow of silence and must knit them shirts from stinging nettles to return them to human form. This is not at all like knitting stinging nettles, especially when using super soft silk and baby merino yarn! 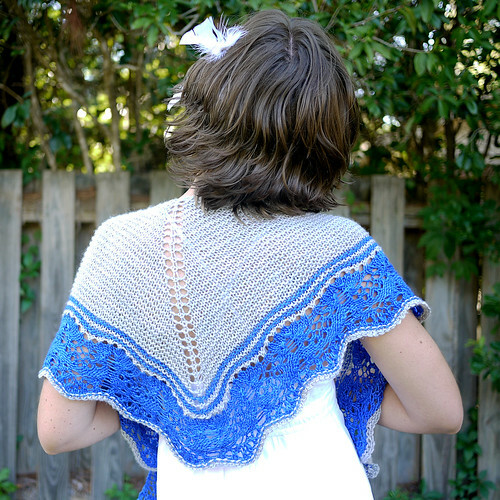 The garter stitch body gives way to lace that resembles the flowers of the stinging nettle. Choose one color or two, large or small. The shallow triangular body with a crescent shaped lace edge makes this reversible shawl extremely versatile and easy to wear in a variety of ways. This shawl is worked from the neck down beginning with a provisionally cast on garter stitch tab. Four increases are made every right side row and two every wrong side row. In the Nettles section, all of the increases are moved to the edge of the shawl and the center stitch is incorporated into the pattern. This allows the lace to flow smoothly. Both written and charted instructions are included. Large: shown in Plum Blossom - 3 skeins. Small: 1 skein MC, Cape Cod Gray and 1 skein CC, Matisse Blue. A triangular striped shawl in the bold colors of a sunset, named for the mythological Greek goddesses of the sunset and the keepers of the Golden Apples. Hesperides is great for using a fun variegated yarn with a complimentary solid color, the striped and lacy stitch pattern helps break up any pooling. This shawl is worked from the top down, beginning with a provisionally cast on garter stitch tab. Four increases are made every right side row. In the Striped Lace sections, the yarn can be carried along the edge to prevent a lot of ends that need to be woven in. Both written and charted instructions are given. and 440 yds for Large). Small and 310 yards for Large). 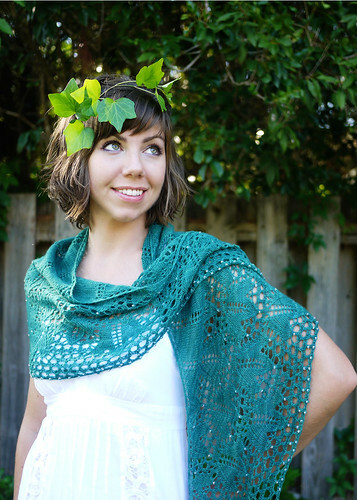 A beautiful crescent shaped lace shawl named for Kisseis, the Lady of the Ivy. She is one of the Nysiades, nymphs of Mount Nysa, in Greek Mythology and caretaker of the young god Dionysus. Iridescent glass beads shimmer like dew in the sun on large ivy leaves. 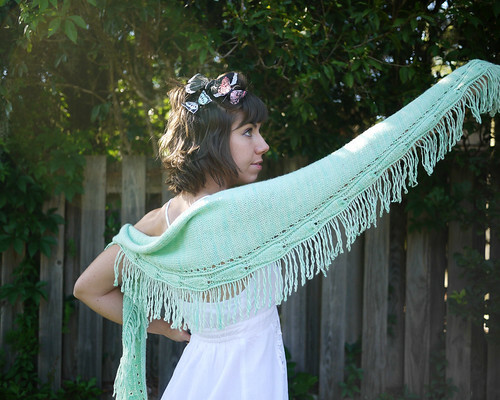 The shape helps the shawl stay secure on your shoulders and the large wingspan makes it great for wearing as a scarf. This shawl is worked from the top down, with varying increases every right side row. It begins with a garter stitch tab using a provisional cast on. To change the size of the shawl, repeats may be added or subtracted in either (or both) the Stem and Ivy sections. In the charted instructions, the 2 stitch garter edges are not charted, nor are the wrong side rows. Since the charts are quite large they are spread over two pages for ease of reading and printing. A separate pdf of the charts is included, for ease of reading on your computer or other electronic device. Photo tutorials are linked in each applicable section for beading and working the double yarn overs on the wrong side. One size: 65 inch/165 cm wingspan, 21 inch/53.3 cm depth. In Hans Christian Andersen’s The Little Mermaid, mermaids live a long time, but they have no immortal soul, so upon their death they are turned into the foam and spray upon the waves. Still, the mermaid sacrifices herself for the Prince and her reward is being turned into a spirit and she may earn a soul by doing good deeds. 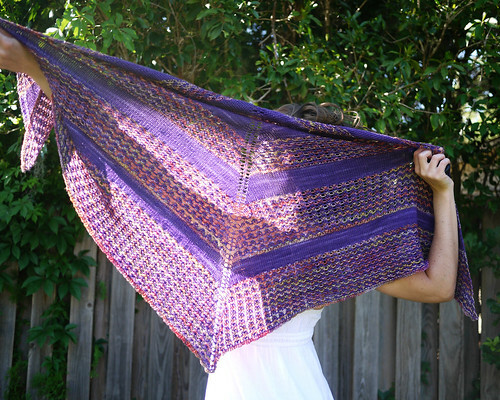 This half-circle shawl is also quite dramatic like the story! Beads glisten along the edge like the sun on the waves. Three different mesh patterns, in a soft and light yarn, float over your shoulders like sea foam. 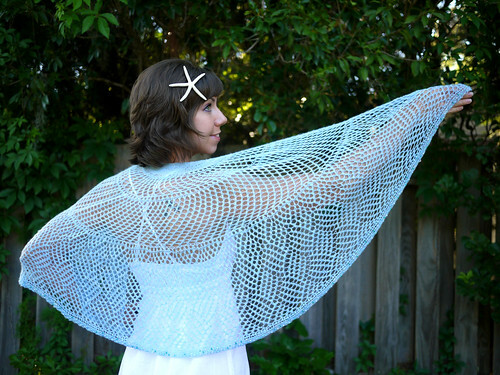 Zimmermann’s Pi Shawl. The beaded edging is worked sideways and attached to the live stitches of the shawl body. Both written and charted instructions are given. A photo tutorial for the edging and beading is linked in the Edging section. shown in Blue Surf - 1 skein. A casual hoodie worked in reverse stockinette stripes to show off the wonderful color variations in hand dyed yarn. Sport weight yarn makes this light enough to throw on as a jacket on breezy spring and summer nights at the beach or a perfect layering piece for the fall and winter. Wonderful details include: a roomy hood, deep pockets and a one-piece buttonband/bottom hem. This pattern is worked top down with a raglan yoke. The inset pockets are worked at the same time as the body. The sleeves are worked inside out in the round. Next the hood is worked from the neckline up and grafted closed at the top. Finally the turned button band and bottom hem are worked in one piece in the round with mitered corners. Sewing down the hems/bands, working and seaming the pocket edging and attaching the buttons and snaps, completes the hoodie. Color 4 - 185 [200, 215, 232, 251, 265, 270] yards. Note: size 34.5/Color 3 and size 51.5/Color 4, use nearly every yard of the skein, you may wish to have an extra on hand just in case. 31.25 [34.5, 37.5, 40.75, 44.75, 48, 51.5] inch bust measurement, modeled in size 34.5 with minimal ease. Madelinetosh tosh sport, 100% superwash merino wool, 270 yards/247 meters. Color 4 - Curiosity 1 skein all sizes. US 6/4mm (or size needed to obtain gauge) 24-32 inch circular needle and an additional two 32-40 inch circular needles or one 60 inch circular needle for working the buttonbands and hem in one piece. 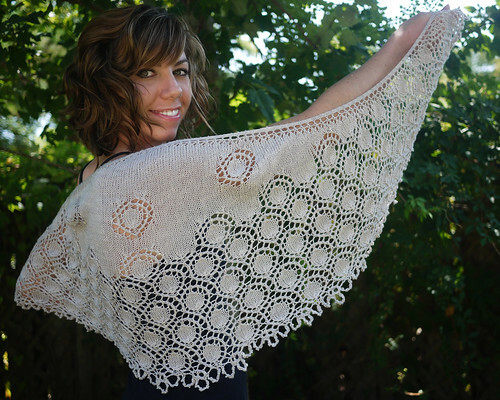 A lacy crescent-shaped shawlette knit in a luminous merino/silk blend yarn. Beads shimmer along the edges of lace bubbles, perfect for special occasions or adding a little sparkle to your every day wardrobe. 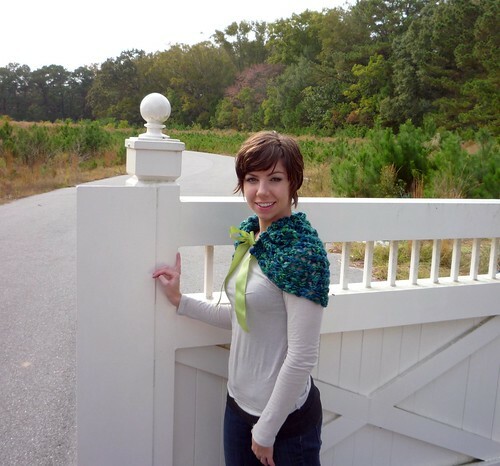 Multiple size and edging options allow you to customize this shawlette based upon your personal preferences. This shawl is worked from the top down, with six increases every right side row. It begins with a garter stitch tab using a provisional cast on. To change the size of the shawlette, additional instructions are given in each applicable section. Instructions are also included for multiple edging options to help you get the most out of your yarn and/or beads. This pattern has both written and charted instructions. A separate pdf of the charts is included, for ease of reading on your computer or other electronic device. yards/100 grams, shown in Oxygen - 1 skein. a warm hat for yourself before a cold front rolls in. 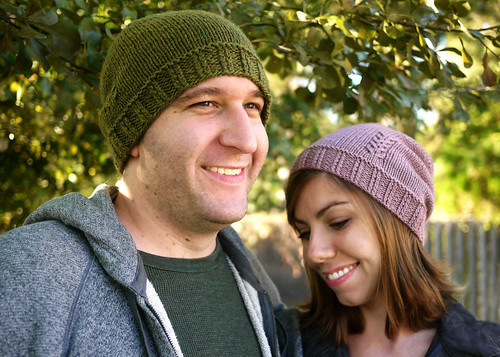 Worsted beanie: S (16/40.5) [M (17.75/45), L (19.75/50), XL (21.75/55)] inches/cm. XL shown, modeled on a 24 inch/61cm head. DK scrunchy: S (16.75/ 42.5) [M (18.5/ 47), L (20/51)] inches/cm. M shown, modeled on a 21 inch/53.5cm head. To fit head circumference: S (17/43 to 19/48.5) [M (19/48.5 to 21/53.5), L (21/53.5 to 23/58.5), XL (23/58.5 +)] inches/cm. Worsted beanie: 17 sts and 24 rnds = 4 inches/10 cm in stockinette stitch with US 9/5.5mm needles or size needed to obtain gauge. DK scrunchy: 20 sts and 28 rnds = 4 inches/10 cm in stockinette stitch with US 6/4mm needles or size needed to obtain gauge. wool, 164 yards/100 grams, shown in Cilantro Heather - approx. 100 [115, 130, 145] yards. DK scrunchy: Viola Silky DK, 50% Silk, 50% Merino wool, 231 yards/100 grams, shown in Chimney Smoke - approx. 150 [170, 185] yards or Knit Picks Gloss DK, 70% Merino wool, 30% Silk, 123 yards/50 grams, shown in Velveteen - approx. 150 [170, 185] yards. A quick, but stunning project for super bulky yarn. 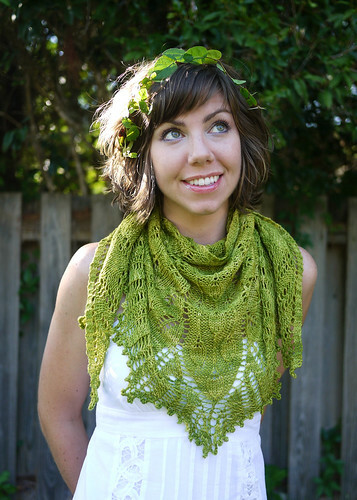 Large leaves lay across your shoulders and back on this crescent shaped shawlette/capelet. A crochet chain with toggles attached at each end allows you to customize the fit around your shoulders. Such an impressive piece for so little work, you’ll want to make some for your friends and family too! Ovate is worked from the neck down. Increases are worked at the edges and within the pattern to create the curved shape. The toggle cord is a crochet chain, with the toggles attached to each end. No buttonholes are needed, due to the large stitches. Both written and charted instructions are given; a separate pdf of the larger chart is also included for ease of reading on portable electronic devices. Small - 42 inch/107 cm wingspan, 14 inch/35.5 cm depth. Gauge is not crucial to this project; but if your gauge varies from that which is given, you may need an additional skein of yarn. Malabrigo Rasta, 100% Merino wool, 90 yards/150 grams, shown in Plomo and Garden Gate. Small- 1 skein, Large - 2 skeins. A versatile V-neck cardigan with simple lines and a decorative rib buttonband. Comfortable like your favorite sweatshirt, only much more sophisticated. Perfect for day or night, work or play, this cardigan will be a timeless wardrobe staple. Plus, worked in worsted weight wool it will be ready to wear in no time! This pattern is worked top down with a contiguous yoke. The buttonband begins with Judy’s Magic Cast On and is worked in one piece. The body stitches are picked up from the buttonband. It continues in one piece, worked at the same time as the yoke and the rest of the body. Once the body and sleeves are complete, the only finishing is attaching the toggles, loops and hook and eyes. 31.25 [34.25, 37.25, 41, 45, 48.25, 51.25, 55.25] inch, 79.5 [87, 94.5, 104, 114.5, 122.5, 130, 140.5] cm bust measurement, modeled in size 34.25 with minimal ease and with 2 inches added to sleeve length and with cuffs turned back. Always wash and block your swatch to ensure a proper fit. 16 sts and 24 rows = 4 inches/10 cm in stockinette stitch on US 8/5mm needles, or size needed to obtain gauge. Madelinetosh Erin Heritage Wool Series, 100% wool, 240 yards/219 meters, shown in Silver Fox: 5 [5, 5, 6, 7, 7, 8, 8] skeins, 994 [1100, 1200, 1355, 1481, 1645, 1757, 1920] yards.